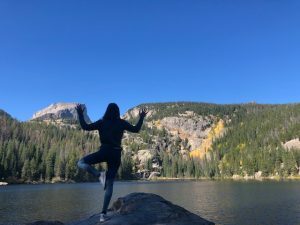 ESTES PARK, Colo.— Upon asking a park ranger for “the best places to do yoga” in the Rocky Mountains, a stagnant pause told me that this is a question she probably does not get too often. Yoga is known to bring peace and healing to both the mind and body. The ancient art is something I have come to know since I started my practice three years ago. I always practice yoga in the safety of an indoor studio, but I wanted to create my own yoga retreat by combining a playful practice in an adventurous setting. 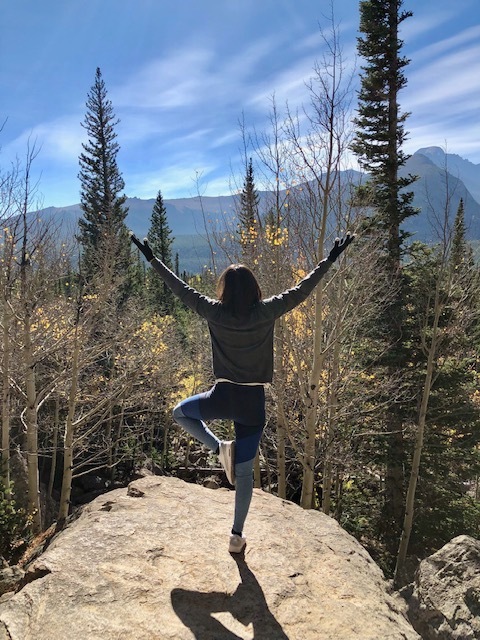 The author attempts a tree pose on a slanted rock at the edge of the mountain (Photo by Jessica Puterman). Practicing in nature welcomes transformation and serenity with a massive amount of beauty to fill all of the senses. As a city girl, Rocky Mountain National Park sits just outside my comfort zone and provides me with a unique environment to challenge myself and grow. When I first began my trip to the Bear Lake area, I was worried about the terrain. 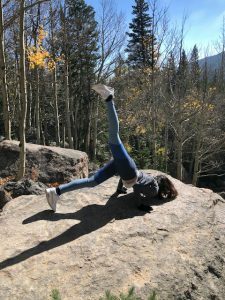 If the Rocky Mountains were named as such because it is covered in rocks, this would make it difficult and painful to practice without a mat. I wanted to leave as many materials behind and find my own way to practice, as natural as I could get. I was pleasantly surprised, however, to see that the Rocky Mountains are not covered in rocks and are named after the huge mountainous structures themselves. My path was soft, covered in a fine beige dust, providing a cushion for my practice. I also worried that there would be no flat spaces to root down in, but I found bridges, pathways and even some rocks that were quite flat and sturdy. Steadying myself in a balance pose on a slanted surface was a challenge that could grow my practice. To root yourself down like a mighty sequoia tree and focus your concentration, or drishti, in any setting is a skill that is transferable to handling life’s stressors. 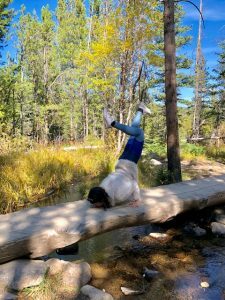 The author attempts dancer’s pose on a bridge in Glacier Gorge (Photo by Elyse Waterman). Trekking up around Bear Lake, I felt the energy of the mountains draw into my lungs and drag out my anxious thoughts with every exhale. I was surrounded by blues and greens, the colors associated with serenity and creativity. The weather was perfect: blue skies and bright sun complemented the occasional windy chill. The air was crisp and it smelled like fall leaves and fresh earth. I felt like a nomadic yogi, traveling through the mountains and building my practice the higher I got. Even though I was out in nature and not in my usual studio, I felt safe. It was as if I knew these mountains well enough to take calculated risks. I felt grounded in a place I had never been before, like the natural surroundings and its furry inhabitants were here to propel me forward to challenge myself. In yoga, we initiate the ujjayi breath, which when done together as a class indoors, sounds like the whooshing of wind or waves crashing by the shoreline. In nature, I felt surrounded by the ujjayi as the wind rustled leaves around me, naturally emulating this ancient sound of strength and unity. It felt like I was practicing with each tree whose leaves whistled in the wind. 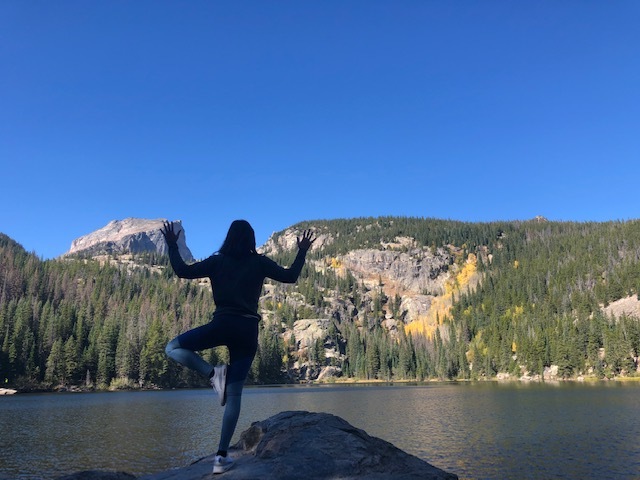 I climbed up to a rock-bed overlooking Bear Lake and tried to balance myself in tree pose. “Just another tree in the forest,” I thought, as I struggled with the slanted rock below me. It was cold outside on this early morning in late September, but I was already sweating with my first pose because the stakes were high. At the edge of Bear Lake, the author attempts tree pose with victorious “cactus arms” (Photo by Jessica Puterman). I could fall into the chilled lake in front of me, ruining the rest of my adventure, or I could fall behind me and earn a trip to the emergency room— also ruining the rest of my adventure. But I focused my drishti towards the beautiful marbled lake that stood before me and balanced into a victorious tree. I felt like one of the many that stood around me. After rounding Bear Lake, I trekked up towards Gem Lake, not really focusing on where to go but choosing the path that just felt right to me. The way I saw it, any path I chose would be new and exciting, full of things I had never seen before. The way up was very vertical. I was out of breath frequently and had to stop multiple times to catch myself. Whenever I came upon a flat space with a view, I took the opportunity to stretch out and then try an adventurous pose. The author moves from chaturanga to up-dog during her practice of Sun Salutation A (Photo by Jenni York). On one of these instances, I tried an arm balance on the dirt ground and quickly found it to be a bad idea. The nice soft dust that cushioned me also blew back up into my face as I exhaled in my arm balance. My face was full of dirt for the rest of the day, but I thought of aparigraha, the sanskrit word for letting things go, and I laughed about it. After all, I came here to experience nature with all of my senses; I can say that I tasted nature’s finest and freshest dirt. As I continued on the path, I found many sturdy bridges that tempted inversions. 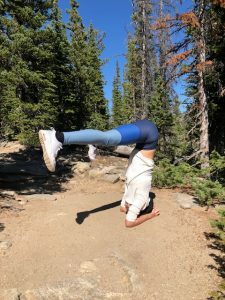 One thing to note is that while practicing on natural ground provides the benefits of a challenge to balance, it can also be painful for inversions. I recommend bringing a small towel or a beanie hat or even wearing a hoodie if the weather fits, just to protect your head with a small layer of additional cushion. I went in for my first inversion of today’s practice, absorbing the sounds of dirt shuffling under me and the accompaniment of leaves in the wind. Other than that, there was complete silence. It was beautiful and calming; it gave me the clarity I needed to play around in a posture that originally was very challenging to me in a traditional yoga class. Once I felt rooted in the ground, I lifted off into a headstand. The rush of blood to my head energized me to take on more adventurous routes and poses. The author attempts a wide leg headstand on the soft dirt path (Photo by Amanda Torres). It was a quiet morning and I came across just a few people during my adventure. However, the people who did see me most commonly reacted by giving me a polite but confused look. Some women told me to be careful as I attempted to invert a little too close to the edge of a cliff. I heeded their advice as I peered down the edge at an elevation more than 10,000 feet. I switched direction towards the end of my adventure to discover Glacier Gorge. There were many more lakes and streams here to offer new sounds to my senses. I came across one bridge over a small steady stream and felt like taking a risk. Chin stands were something I had yet to try, but felt like I was in the right place to do. I put my chin on the ground, hoping that no elk, or for that matter, elk poop, had made its way to the same spot in the distant past. I floated up and while it was not the prettiest form, I was excited that I could even do it. 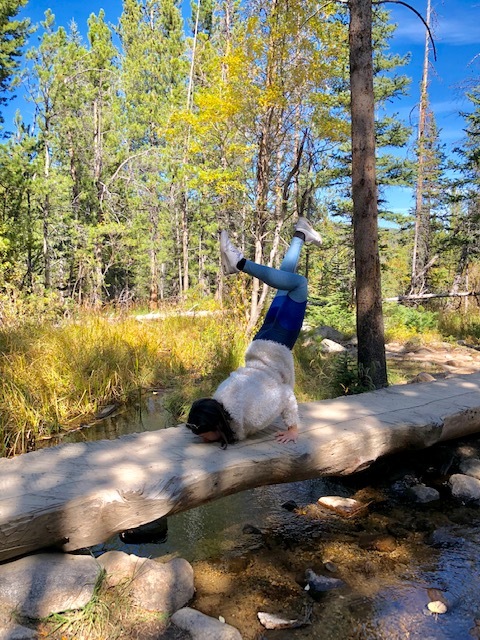 On a wooden bridge over a small stream full of trout, the author attempts a chin-stand (Photo by Elyse Waterman). I reached the top of Glacier Gorge Trail to discover Alberta Falls. All of my senses got goosebumps; the smell of fresh water, the waterfall’s mist that tickled my nose, and the rushing sound of ujjayi were a lot to take in. I decided that this was the perfect place for shavasana, or corpse pose; a pose of meditation and opening up to the universe. 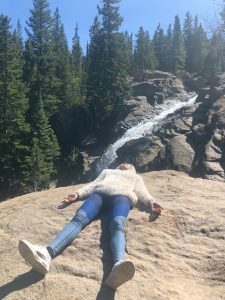 I laid down on a big rock and cleared my thoughts, palms faced upwards to welcome what the universe has in store for me. I slowed my breath, breathing in for eight seconds, pausing for four, and exhaling for another eight. I woke up a few minutes later out of my meditative state feeling new and healed. The author lays in shavasana, a meditative relaxation pose, by the edge of Alberta Falls (Photo by Elyse Waterman). 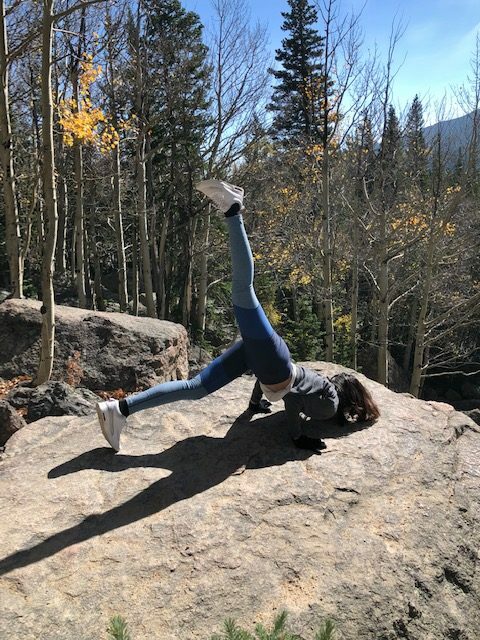 As I made my descent down the trail to our car, I paused once more to climb a rock two times taller than me and offer a namaste to all of nature’s beings that surrounded me and helped me grow during my practice. 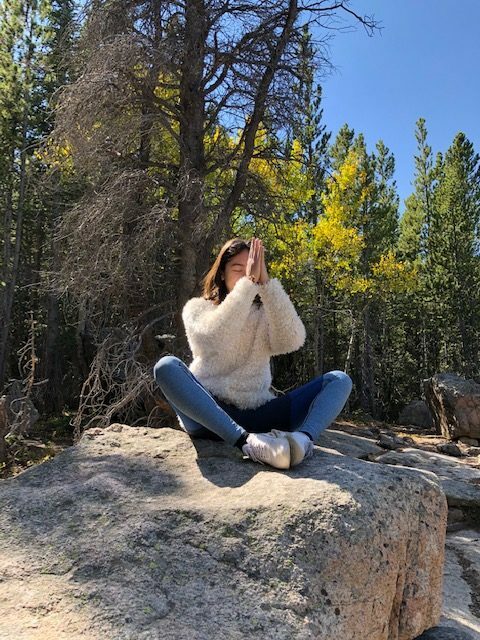 While personal yoga retreats may not be common in the Rocky Mountains, it offered me the most peace I have felt in many years. The author closes her practice by acknowledging and sending good energy to those around her (Photo by Elyse Waterman). Bring plenty of water to drink and some light snacks. The elevation adds extra challenge to any physical activity, so start slow with your practice and experiment safely away from risky cliffs and difficult surfaces. Dress in layers as the temperature changes throughout the day. No yoga mat is necessary if you are fine with getting a little dirt on yourself. “Inversion junkies” should bring a small towel or beanie to provide extra cushion for the head.